Education has been moving towards technology for quite some time now. In capitols all across America, legislatures have been allocating funds to develop new educational software. This, as they correctly believe, is the most ideal way to reach a generation that finds itself consistently hooked to glowing screens and real-time connectivity. There’s no doubt this is the right approach, but there’s multiple disconnects occurring with the creation of these proprietary technologies. Often, a school’s pool of teachers ranges dramatically in age and technological experience. This creates a situation where new technologies need to be taught not only to the students, but teachers as well. Digital whiteboard is a technology that was heavily pushed for educational purposes. It’s essentially a projector-whiteboard hybrid with a magnitude of diverse, and impressive capabilities. If this tool is so diverse though, then why do so many of these units sit unused and underutilized in school environments? One of the largest problems is that those in education leadership positions underestimate the scope of training required for these devices. First, teachers need to be made aware of how the device is to be used. This is seemingly simple, but the perception of “simplicity” is what makes it an issue in the first place. Learning how to use a device doesn’t mean figuring out how to turn it on. It needs to encompass the use of expanded capabilities, classroom integration and, most importantly, trouble-shooting. Many teachers, often less tech savvy then others, immediately shun this technology for multiple reasons. Some feel it’s too complex and takes up valuable class time and some don’t understand the devices extended capabilities and view it as an overpriced whiteboard. If something goes wrong with the device, resuming normal operation will undoubtedly waste valuable class time. I’ve been in a class where the entirety of a course day was spent attempting to fight through a “technology integrated” lecture. This is not only counter intuitive to the device’s function but serves to further distance those in academia from technology’s potential. A technology that’s supposed to be bridging the gap ultimate serves to burn the bridges before they were even created. Teachers need to be confident in the tools they’re being given in order for these devices to be used effectively. Training is key for successfully implementing these devices. Up until now, training has also been what we’ve lacked. 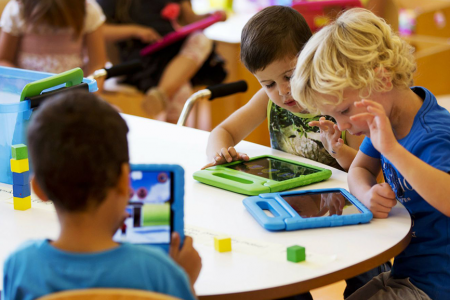 Instead of creating new technologies to meet our educational needs, the recent trend has been utilizing existing technologies to promote familiar continuity between the home and educational environments. This is the approach we need to be taking. If training has been the downfall of previous integration attempts, then why not try and eliminate the need for training all together? According to an article by Examtime, 84% of current Gen X students have smartphones. This is where the opportunity lays and, finally, the decision making process is beginning to reflect this. Students and teachers are familiar with smartphones and applications are essential to smartphone use. So why not focus on educational applications? We know the potential for the mobile education market is limitless. There’s more mobile phones in circulation than people on this planet. Content can be created, translated, adapted and shared to anyone anywhere in the world within a matter of seconds. Entire educational plans can be developed on a mobile application, shared and translated to a classroom projector halfway across the world on a moment’s notice. Here’s the point that should really hit home with this idea: Everyone can use these devices. They’re widely available, becoming highly affordable, and with proper design language, often incredibly intuitive. This article isn’t supposed to be a criticism of digital whiteboards. They’re, as previously stated, incredible devices. If anything, this is a criticism of how things were done and a reaffirmation of the course educational institutions are taking now. We’re finally striking that balance between functionality and usability, now it’s time for large scale implementation. What Exactly IS a Hackathon?